My project on machine vision will be funded by the ERC! Amazing news today: my ERC Consolidator project is going to be funded! This is huge news: it’s a €2 million grant that will allow me to build a research team to work for five years to understand how machine vision affects our everyday understanding of ourselves and our world. In the last decade, machine vision has become part of the everyday life of ordinary people. Smartphones have advanced image manipulation capabilities, social media use image recognition algorithms to sort and filter visual content, and games, narratives and art increasingly represent and use machine vision techniques such as facial recognition algorithms, eye-tracking and virtual reality. The ubiquity of machine vision in ordinary peoples’ lives marks a qualitative shift where once theoretical questions are now immediately relevant to the lived experience of ordinary people. 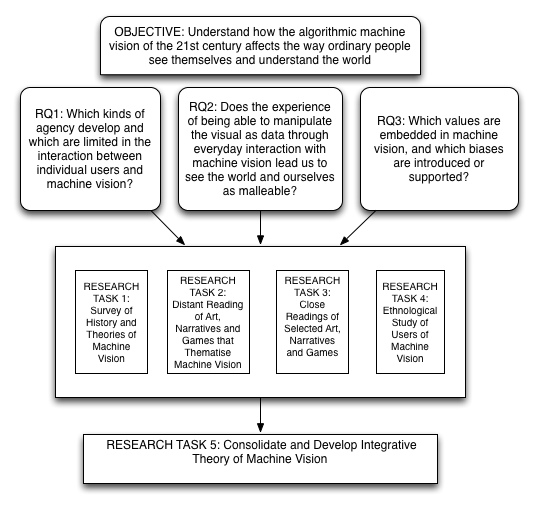 MACHINE VISION will develop a theory of how everyday machine vision affects the way ordinary people understand themselves and their world through 1) analyses of digital art, games and narratives that use machine vision as theme or interface, and 2) ethnographic studies of users of consumer-grade machine vision apps in social media and personal communication. Three main research questions address 1) new kinds of agency and subjectivity; 2) visual data as malleable; 3) values and biases. MACHINE VISION fills a research gap on the cultural, aesthetic and ethical effects of machine vision. Current research on machine vision is skewed, with extensive computer science research and rapid development and adaptation of new technologies. Cultural research primarily focuses on systemic issues (e.g. surveillance) and professional use (e.g. scientific imaging). Aesthetic theories (e.g. in cinema theory) are valuable but mostly address 20th century technologies. Analyses of current technologies are fragmented and lack a cohesive theory or model. MACHINE VISION challenges existing research and develops new empirical analyses and a cohesive theory of everyday machine vision. This project is a needed leap in visual aesthetic research. MACHINE VISION will also impact technical R&D on machine vision, enabling the design of technologies that are ethical, just and democratic. The project is planned to begin in the second half of 2018, and will run until the middle of 2023. I’ll obviously post more as I find out more! For now, here’s a very succinct overview of the project, or you can take a look at this five-page summary of the project, which was part of what I sent the ERC when I applied for the funding. This is excellent news: the project sounds intriguing. Very glad you have been funded! Gratulerer. Dette ser, mildt sagt, veldig spennende ut. Flott at forskning på dette feltet kommer med litt andre innfallsvinkler en det rent teknologiske.